Raquel Crites is the EarthTeam student of the month for May 2015. Raquel has participated in the Zero Litter after school internship at San Lorenzo High School where she is a junior, soon to be senior. 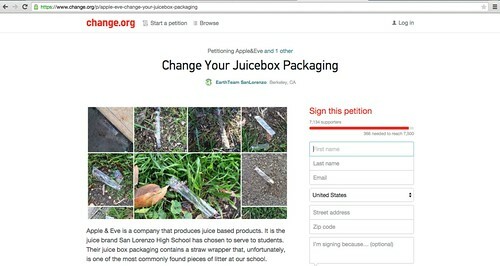 While Raquel stands out for many reasons, we're highlighting her for her leadership around the Change.org petition she helped spearhead to reduce waste on the San Lorenzo High School campus. Working together with a team of other interns, Raquel collected litter data on campus finding the most common item to be a plastic straw wrapper from the juicebox manufacturer Apple & Eve. After discussing options for action, Raquel's idea to start a Change.org petition to ask Apple & Eve to change their packaging to be more environmentally friends caught fire and went into development. Students wrote and designed the petition to explain their findings and articulate potential solutions to the company Apple & Eve and launched the petition. Within days of it's launch the petition had received support from people around the world. Comments flooded in with people echoing the student's sentiments and encouraging alternatives to plastic straw wrappers. Over 7,000 people to date signed the petition which has come back to their campus to make change close to home where the idea was born. We commend Raquel for sparking a great idea and working together with an amazing group of other students at San Lorenzo High School to make a change on their campus. Trinh and Nhi from San Lorenzo High School are the EarthTeam March Students of the Month. These two students have been making big waves in our Zero Litter Project since joining the EarthTeam Zero Litter after school internship at San Lorenzo High in December. Particularly they've been dominating the leaderboard for both amounts of litter and a diverse range of locations throughout the East Bay. Together these two students have been responsible for picking up over 1,000 pieces of litter in 3 short months in parks, at their school campus, in their neighborhoods and more. 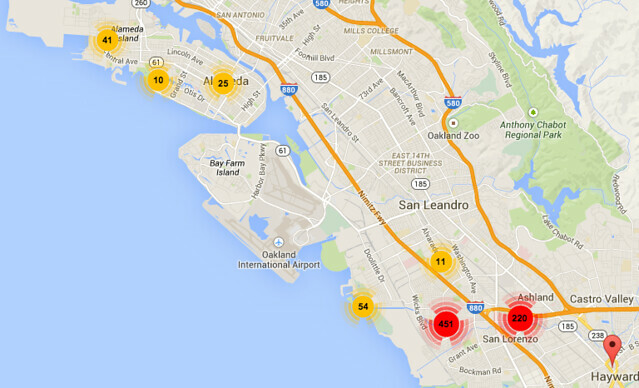 Check out the map below with some of the hotspots they've discovered. We are inspired by these two students and proud of their work thus far. Thank you for contributing so much to the Zero Litter Project. We can't wait to see what you all do with this data! Mayra and Maria are the EarthTeam Students of the Month for October 2014. These two young women are both Seniors at Skyline High School and returning EarthTeam after school interns. Mayra and Maria started working with EarthTeam last year with the after school internship focused on building and maintaining an outdoor classroom on the Skyline High School campus. They've returned to EarthTeam for a second year to participate in this year's Watershed internship which finds the two interns in a more experienced position. We are happy to have these two returning and bringing their leadership and experience in projects to the internship and the other students. Looking forward to a great year with you two and all the other interns at Skyline! Watch an interview featuring Mayra and Maria from a recent field outing above. 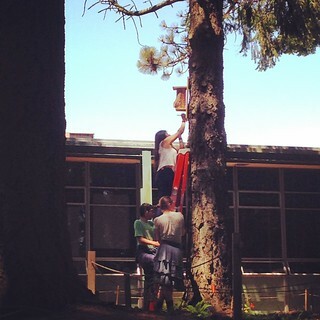 Oakland High School's EcoMatic interns are the EarthTeam Students of the Month for May 2014. What started as a simple gathering of students interested in helping green Oakland high's campus this past Winter blossomed into much more. 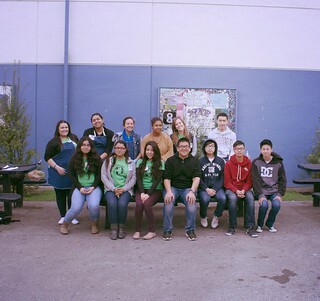 EarthTeam interns at Oakland High named themselves "Ecomatic" as a nod to their goal of making ecological thinking automatic among their peers. They quickly got to work collaborating with neighboring EarthTeam student interns at Castlemont high to learn more about their waste system and how to best make changes on campus to influence student behavior and culture. They went on field trips to the landfill to learn more about the larger systems in which they and their schools work within as well as a trip to Cal Berkeley's dining hall to see how food waste is dealt with on a large UC campus, all the while expanding their ideas to bring back to their campus. Finally, interns headed to the LEAF conference in May to participate in a variety of workshops and link up with other student leaders from throughout the county around sustainability efforts. We are proud of the Oakland high Ecomatic and look forward to working with you all again next year! EarthTeam's Youth Advisory Board does much of their work behind the scenes. They consist of High school and Middle school environmental leaders from all over Alameda County who come together monthly to network, support one another's efforts, gain valuable professional development skills and plan EarthTeam's annual Leadership and Environmental Action Forum, or LEAF, in the Spring. This month we wanted to recognize these hard working youth who have been putting in lots of their time and creative ideas behind the scenes to make this year's LEAF conference incredible. Get to know the amazing young people that make up the Youth Advisory Board right here on the EarthTeam website and then check out more about the LEAF conference they are planning by visiting this link. Keep up the great work Youth Advisory Board! Interview with Helen and Dina above. Helen Kang and Dina Parks are EarthTeam's Students of the Month for February 2014. Helen and Dina are 8th graders at Harvest Park Middle School in Pleasanton, CA. They are both in leadership class and participated in EarthTeam's Transportation Action Project during December of 2013. These ladies have a bright future ahead of them. Thank you both for helping curb climate change. Keep up the good work! Watch the interview with Esmeralda and Jennifer below. We are inspired by the work and wisdom of these two young women and look forward to seeing their work and the work of their peers as the year progresses. Keep up the great work ladies! Watch the interview with Elijah on YouTube below. Elijah Taylor is a senior at Mission Valley ROP in Fremont, CA and is our October Student of the Month. Elijah caught our eye in the Spring of 2013 when he volunteered for the bin monitor position during a waste audit in Janay Shepherd's class. This position is one of the more technical jobs during a waste audit as this person has to be confidante helping students figure out where to put various items found in the trash and help them sort them into the proper bin. This person has to have knowledge of what items are made of and where they belong in the waste stream, but also help other students make their own discoveries and learn about waste materials too. Elijah was the man for the job in the Spring and this month when given the chance to volunteer for a second waste audit he was the first to stand up and volunteer again. It’s no surprise Elijah is the one standing up to volunteer for a job during a waste audit. Students in his class work on professional development and job skills including getting a part time job in their nearby community and Elijah, for the past 2 years has been working with the custodial staff on campus at Mission Valley ROP. He describes his job as, “I work with the janitors at Mission Valley ROP and I clean the lunchrooms, I make sure all the campus is clean outside, empty out all the trashcans, make sure no one puts stuff in the wrong place—put it where it’s supposed to be—clean the hallways. Then we actually spot mop and stuff like that—so basically keeping the campus clean”. He is the resident student expert in waste systems on campus and he’s helping students as well as custodial staff to keep the campus clean. When asked about the work he does on campus Elijah responds, “It’s a job to me. In the future I want to build my own business by doing this kind of stuff”. We here at EarthTeam are proud of your work both in the classroom and around campus. Thanks for taking care of business and helping your campus community reduce their environmental impact at the same time. EarthTeam's Student of the Month is Emily Tam of EarthTeam's Environmental Justice League, an after-school restoration program at Skyline High School. Emily is a senior at Skyline High School, and from the minute she applied to the program, has shown responsbility, maturity, and an openness to learn about restoration and Redwood ecosystems. Through the internship, Emily constantly volunteered for projects and employed her fantastic creative intellect to make the development and completion of those projects personal. 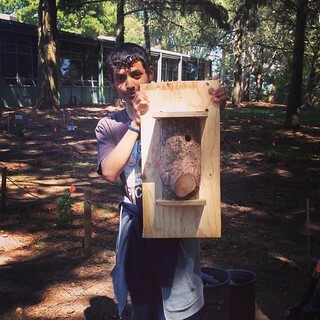 Emily expresses the fruits of her hard work best in her own words: "When I first heard of the Earth Team internship program, I wanted to join because I felt that it would be nice to give back to my school and to learn about the special ecosystem that surrounds my school. I knew that the Skyline campus was special compared to other schools in Oakland and it was one of the main reasons why I chose Skyline. I grew up surrounded by redwoods and I knew they were special so that made me more inspired to join the Environmental Justice League. 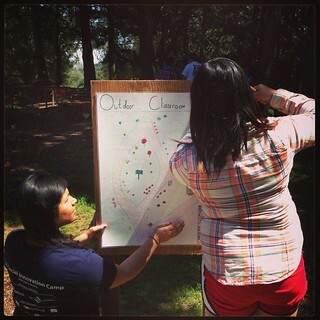 Through the Environmental Justice League, I learned a lot about teamwork. 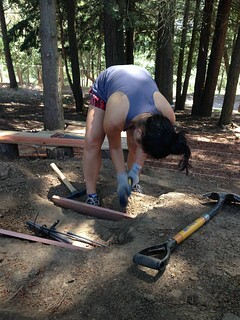 The League members had to work together to complete our tasks efficiently and in the best way possible. This skill I gained will benefit me in the future because there will be many chances where I would have to work in teams or groups. I truly enjoyed being a part of the Environmental Justice League because I learned so much about the importance of redwoods and how they should be appreciated for the role they play in our environment. It was great working with people around my age who shared a similar passion for the environment." The Restoration Director is so honored to have worked with Emily every week for a year, and while she's sad to see her graduate, Chiara is excited to see what the future holds for such a responsible, passionate young woman as Emily! EarthTeam’s Student of the Month is Mayra Avalos, a freshman student in the Sustainable Urban Development Academy (SUDA) at Castlemont High school. 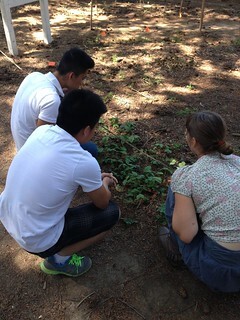 As a SUDA student, Mayra is taught indepth curriculum regarding environmental topics. EarthTeam was first introduced to Mayra in Michelle Espino’s class who participated in the Waste Action Project. Mayra was one of the student volunteer’s during the waste audits and showed herself as a leader that day. Mayra was very active during the action planning phase and contributed to the over all concept of her class’s action plan. Mayra is currently decorating recycle bins and distributing them to classrooms to promote in-class recycling on her campus. This semester Mayra reappeared in Mitch Singsheim’s class and participated in another EarthTeam program, the Transportation Action Project. During the action planning portion of the program Mayra again emerged as a leader with the experience she gained during the Waste Action Project. Mayra worked closely with her group to promote collaborative thinking around reducing CO2 through transportation habits. Mayra personally reduced her CO2 emissions and helped her class collectively reduce 15 pounds of CO2 in one week! EarthTeam hopes to see Mayra next year at Castlemont High and to see what her leadership brings to the community for the 2013-2014 school year. Congratulations Mayra and keep it up! EarthTeam's Student of the Month is Jennifer Navarro, an Aqua Team senior from Richmond High School. Jennifer has been an enthusiastic member of Aqua Team who pays excellent attention to detail in her field work and provides thoughtful answers to discussions in after-school meetings. She plans to attend San Jose State to study bioengineering next year. We are proud of what she's gotten out of the program: "Aqua Team has made me realize how you are never too old to start caring for the environment. One of the things I love about Aqua Team is how we build friendship among each member in the group...[by]... making everybody feel welcome. But most of all I love that feeling of accomplishment I get at the end of an outing. It's something special because not everybody is down to get a bit dirty to help out in our own community." Congratulations, Jennifer and good luck next year and beyond!